Jessica Rosensveig is an illustrator, using mostly watercolour. Since 2012, she publishes regularly a comic strip in her blog (www.thefluffybeaver.com). She is also a French tarot player. When living in Stratford-upon-Avon, she discovered that the number of plays by William Shakespeare is exactly the number of trump and court cards. 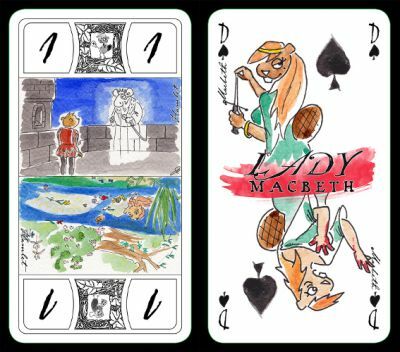 As she said, that's just the excuse she needed to justify her Fluffy Beaver Tarot Card Game inspired by Shakespeare. The result, self-published, is quite an attractive pack and even some pip cards are illustrated. All the anthropomorphic animal characters came from the Canadian blog. This pack should please comic, animal or Shakespeare lover. Cardmaker or editor: France-Cartes (Carta-Mundi).